Sladky noted, "The audience participation in regard to questions, and interaction with the live tube and pipe and roll form displays was exceptional." 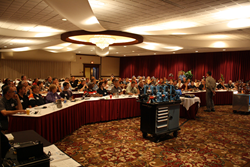 Roll-Kraft once again hosted its regional seminar for the tube and pipe industry on August 19, with a seminar for the roll form industry on the following day. Both training seminars were preceded by tours of Roll-Kraft’s state-of-the-art corporate headquarters in Mentor, OH. Robert A. Sladky, Vice President of Tube Mill Engineering organized the event and was one of the speakers both days, along with Bret Molnar, and Dave Rostocil, Senior Technical Performance Specialists. Attendees from over 30 different and widely diversified companies graced the programs during the two-day event at the LaMalfa Holiday Inn Conference Center. Very valuable information that was not clearly addressed during actual on-the-job training back at our plant. We should have had this long ago. This seminar has shown me things I can do while designing tooling that will prevent misshaping of the profile. Robert & Bret work very well together to make the class both easy and full of information. This has shown me how the mill affects the tooling, not just the way that the tooling was designed. Roll-Kraft’s next regional training seminar will be in early in 2016 in Houston, with tours of Roll-Kraft’s new facility. Be sure to check the Roll-Kraft Events page for information, as the seminar dates are finalized. Announcements will be posted on http://www.roll-kraft.com and e-mail blasts sent to all of Roll-Kraft’s customer base.